I don’t share every recipe that I make on the blog. Unfortunately, as much as I’d like to spend time photographing each dish, I’m sure my children would begin to pound their little dirty fists on the table in protest. But every once in awhile, a dish comes along that simply begs to be shared. Einkorn rhubarb cake, for example. Please, Shaye. Share me on the blog. I promise I’ll hit all the important notes of a dessert! Oh, come on Shaye! I’ll be gently and richly sweet. A bit tart. So moist you’ll want to slap your Mama. And I’ll celebrate the best of a humble ingredient: rhubarb. SHAYE! I beg you! I’ll do anything! What do you want from me? Do you want me to be easy? Only mess up one bowl? And not require you to sift your dry ingredients together? Consider it done! The einkorn rhubarb cake has spoken and won me over with its powers of persuasion. Well, that, and the fact that I’ve made this cake no less than a dozen times already this season ( surely a tell). It must be good. Really good. Y’all know I hate fussy cakes – in fact, I can easily turn my nose up at most desserts quite easily. But subtle, tasteful cakes like this beauty get me every time. Start by cutting the rhubarb in thumb size pieces. 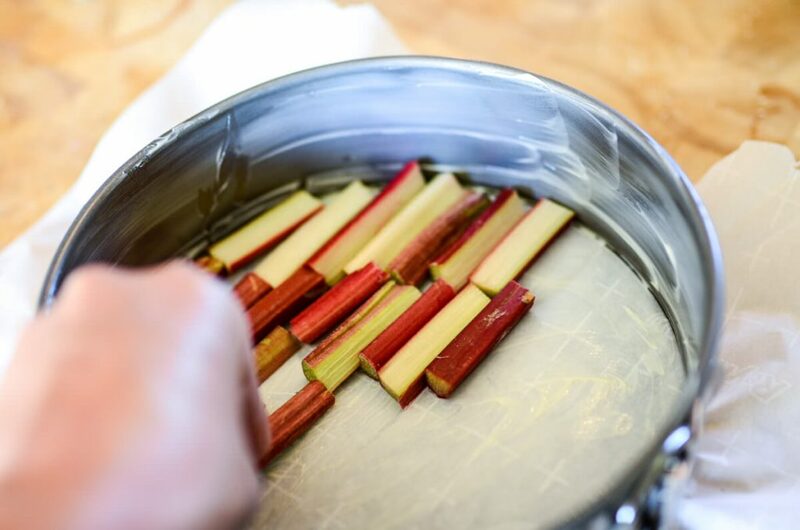 In a buttered 8″ cake pan (I use a springform pan like THIS lined with a small piece of parchment), lay the rhubarb pieces down in a single layer, covering the entire bottom of the pan. This will create a pretty top to the cake a bit later on. 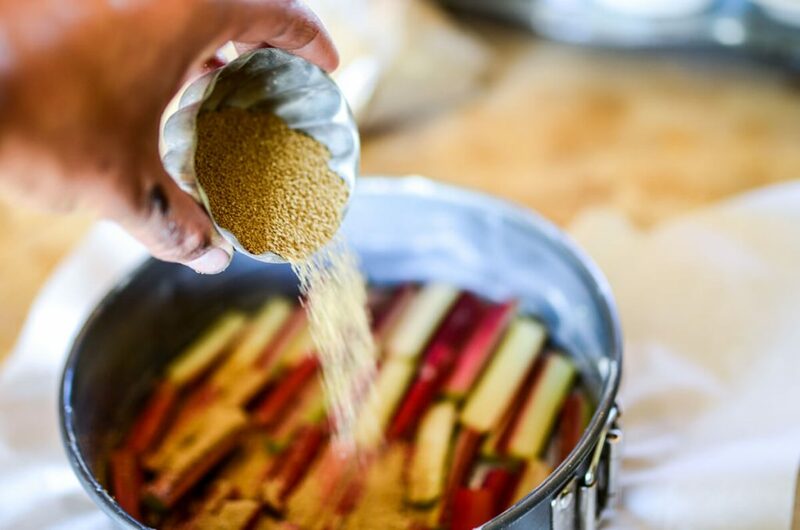 Sprinkle the rhubarb with 1/4 cup of the cane sugar and allow it to sit while we tend to the rest of the cake. 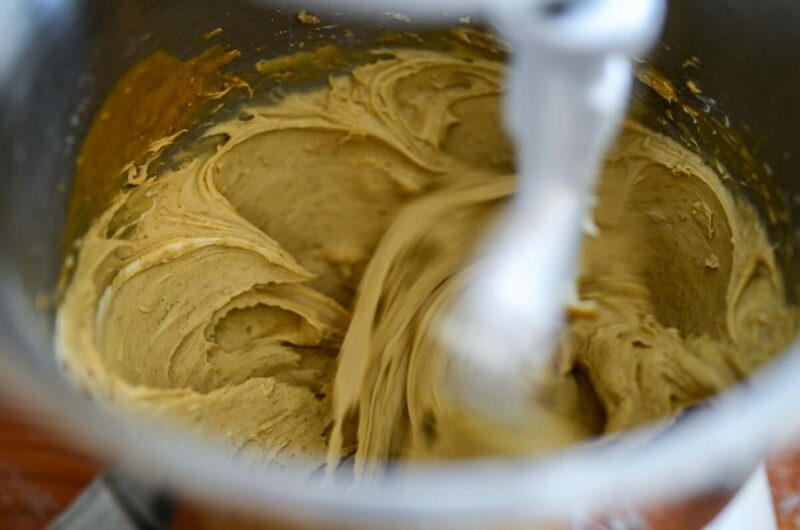 In a stand mixer, cream the butter and sugar together until it’s light and fluffy, about three minutes. Add in the salt, vanilla extract, and the eggs – one at a time. Allow each egg to fully incorporate before adding another. Then, add in the sour cream. Mix until the mixture is, once again, light and fluffy. Lastly, mix in half of the flour. Allow it to incorporate. Mix in the other half. Boom shaka laka. Lastly, mix in the baking soda. Wouldn’t want to forget that, now would we? Mix until it’s all combined well. I’m sure you’re catching onto that by now. 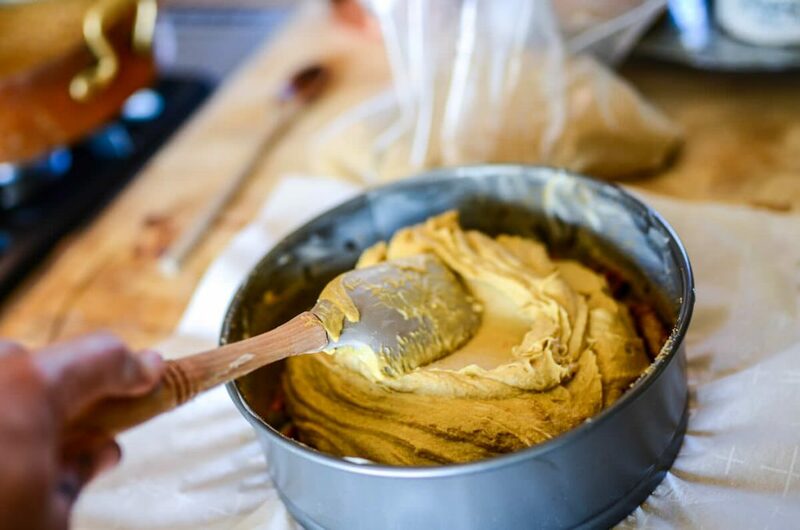 Now, remove the bowl from your stand mixer and use a spatula to gently transfer the cake batter to the cake pan – right over the top of that delicious rhubarb that as of now, has begun to start releasing some of its tart juices. Perfection. I am in love with this batter. 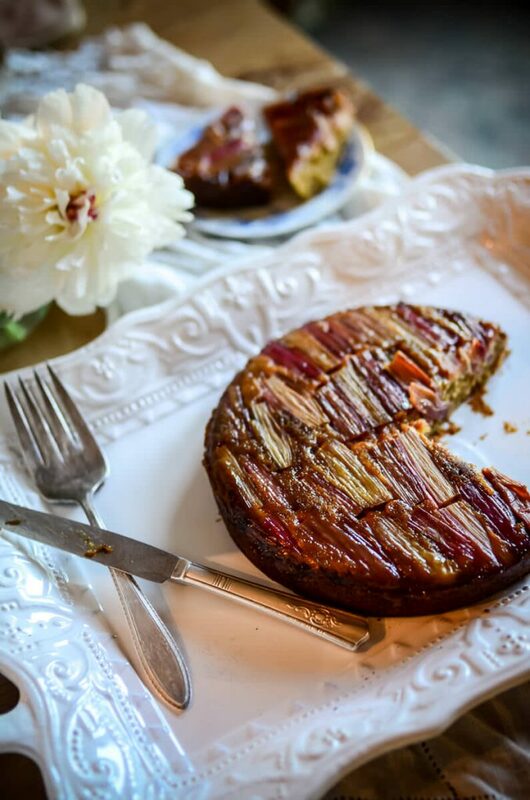 I am in love with this einkorn rhubarb cake! I am in love with YOU! Just kidding. Am I? This just got weird. Bake the cake in a 350 degree oven for about 40 minutes, until the cake no longer wobbles in the middle if you jiggle the pan. Remove it from the oven and release the springform. Allow the cake to cool before carefully flipping it onto a plate. I wanted to photograph this part of the process for you but regretfully, I don’t have three hands (one for holding the plate, one for holding the cake pan, one for taking the photograph). I’m sorry for letting you down. There she is, ladies and gentleman! Buttery, tart, sweet, and about as well rounded as a dessert could be. Please promise me you’ll make it with einkorn flour (you can buy it here). It’s so delicate and buttery – it’ll take your baked goods to a new world. Did you think I’d fallen off this world? I hadn’t. Rather, we’ve spent the last three weeks with our heads down working on the bathroom remodel. Six people. One bathroom. Twelve days with no indoor toilet or shower. It got hairy. And stinky. And dirty. Sorry for ending a beautiful post of einkorn rhubarb cake with dirty bathroom talk. « Letting Go Of Superwoman. This looks incredible, and for once I have everything needed to make a new recipe!! Just to clarify is it baking powder, not soda used in the recipe?? Came here to clarify the same thing. Big difference in a baked recipe like this! I still wig out over your carrot cake. so delicious!! need to get my hands on some rhubarb so I can make this. Mom made. Thanks for the recipe! New to your site. I love it. Wondering on this cake can I substitute with Almond flour? Appreciate any help on this one. Not sure if there is responses to commenters questions….